Norfolk is in the Hampton Roads region of Virginia. It is a port city with a large Navy and shipping presence. Neighboring cities are Virginia Beach, Chesapeake and Portsmouth. Norfolk has always been a Navy town, home to the world's largest naval base. But it is also known as a major cultural center, with world-class museums, opera, symphony, ballet and a vibrant arts community. In the last ten years or so, downtown area has experienced a major resurgence, with gourmet restaurants, shopping and attractions. Town Point Park is a waterfront park area right downtown that hosts several festivals and events throughout the year. A new cruise terminal was just built in 2007 making Norfolk one of the top cruise ports in the country. Granby Street is the main downtown thoroughfare, lined with restaurants and bars. Ghent is a historic district adjacent to downtown. Filled with historic homes, tree-lined streets and beautiful old churches, it is a good mix of residential and business. Colley Avenue and 21st Street are the main shopping and dining areas, with dozens of locally-owned boutiques, shops, antique stores, restaurants and bars. The Naro theater on Colley Avenue is the region's sole movie theater with indie flicks. Ocean View is Norfolk's beach community, and features relatively uncrowded beaches on the Chesapeake Bay. During the '50s and '60s, Ocean View was in its prime and was a major beach destination for families and sailors. During the following decades, the beach community fell into a bit of a slump, succumbing to crime. The last five years, the city has been turning things around and now Ocean View is on its way to becoming one of the region's most sought after neighborhoods. Hampton Roads is only second in the state to the suburbs of Washington, D.C. such as Fairfax County and other outlying areas for horrendous traffic especially during the summer season when many tourists throughout the United States and Canada flock to the beaches of Virginia Beach and the Outer Banks in North Carolina. Be aware of the alternative of I-664/Monitor-Merrimac Memorial Bridge-Tunnel instead of the Hampton Roads Bridge-Tunnel, where back ups of more than 40-50 minutes usually occur, long before rush hour even begins. Route 460 is an alternative to the heavily used I-64 route. 460 extends from Petersburg, VA (just south of Richmond, VA) to Chesapeake (a suburb city to the Hampton Roads area) and you can easily connect from 460 onto the major beltway at the I-664 and I-64 interchange. Interstate 64 will bring you to Norfolk from points west. Amtrak runs one daily passenger train into the 36.843466-76.2760923 Norfolk train station via the Northeast Regional route. An alternative way into Norfolk is another spur of the Northeast Regional route which terminates at Newport News. Amtrak runs Thruway buses from the 37.0228-76.45194 Newport News train station to Norfolk and Virginia Beach. Greyhound runs many buses through Norfolk daily. The Greyhound station is located in downtown Norfolk. In addition, there are Chinatown buses that run through Norfolk. These buses come from New York City, Boston, Washington, D.C., and other locations in the Northeastern USA. Norfolk is accessible by private boats via the Intracoastal Waterway, from the Elizabeth River and the Chesapeake Bay. Overnight docking is available at Waterside Marina in downtown Norfolk. Hampton Roads Transit (HRT) operates the bus service in Norfolk. There are many routes in Norfolk, and the service can get you to almost any spot in Norfolk. Most buses run seven days a week early morning to late evening, and are relatively reliable. The current fare is $1.75 for a single trip. $4.00 will get you an all-day pass which is usable on buses, the ferry, and Tide Light Rail. Bus drivers do not carry cash, so be sure to bring the exact fare for each rider. Hampton Roads Transit runs a passenger ferry from Portsmouth. Service is seven days a week and runs every half hour with more frequent service during rush hours. The fare is $1.75 one way, and $4.00 for an all-day pass. The ferry's crew does not carry cash, so be sure to bring the exact fare for each rider. There is also a privately run boat taxi that will take you around the Norfolk and Portsmouth waterfronts. The fare is 7 dollars per person. Call 757-439-8294 and the captain will pick you up anywhere on the waterfront. Since August 2011, HRT has operated the Tide Light Rail, a starter light rail line extending from the Newtown area at the Norfolk/Virginia Beach border to Downtown Norfolk and Sentara Hospital by the Midtown Tunnel. The Tide runs seven days a week every half hour with service increasing to every ten minutes during rush hours. The Tide is air-conditioned and has free WiFi access. The fare is $1.75 one way, and $4.00 for an all-day pass which is usable on the Tide, the ferry and HRT buses. All-day passes, multiple-day passes, single ride and multiple ride tickets are sold at vending machines, which are located at every station. The ticket vending machines accept cash, debit cards and credit cards. The light rail is operated on the honor system, meaning that there is no one to check your ticket before you get on the Tide. However, the trains are monitored by uniformed police officers who will check for tickets. Riding the light rail without a valid ticket can cost you a $250 fine. If you must drive around the city, a good map and/or a local with knowledge of the roads is an absolute necessity. Stay on interstates for as long as possible, for once you leave, any signage is the responsibility of the city, not VDOT, and it shows. If your directions tell you to follow US 58, US 460 or state route 337 through the city, be prepared for a nerve-wracking drive. Directional signage (i.e., US 460 east, turn left) is virtually non-existent, and what signage does exist is more often than not inadequate or even incorrect. If there is a difference between signage and a map, the map is correct. Routes can and do change direction and shoot off onto side streets at a moment's notice, often without any signage advising travelers as to which road to follow. It is much easier than you might think to miss a turn and end up in a dangerous area. 36.857-76.29241 Chrysler Museum of Art, One Memorial Place, ☎ +1 757 664-6200. Tu-Sa 10AM-5Pm, Su Noon-5PM. Walter Chrysler, Jr., son of the Chrysler automobile company founder, donated his art collection to Norfolk, the hometown of his wife. His donation along with other donors formed the collection of this museum. A large variety of art can be found in the museum, including paintings, glass, porcelain, clay, sculptures and photos. Art from different geographies are also present, such as African, Asian, Egyptian, Greek and Pre-Columbian/Mayan. A glass studio located in a separate building south of the museum hosts a free glass art demonstration daily at noon. Free. 36.945-76.3130563 [dead link] Naval Station Tour. A 45-minute tour conducted by Naval personnel. See aircraft carriers and other huge ships. 36.847389-76.2944444 Nauticus - National Maritime Center, One Waterside Drive. Naval Museum exhibits maritime artifacts. Next to it is the decommissioned USS Wisconsin (BB 64) battleship, now serving as a museum ship. Visitors get a self-guided tour the interiors of the ship such as sleeping quarter, medical bay, sonar room, mess hall, ship's convenience store and the main deck. Alternatively, visitors can pay extra for guided tour of the engine room, or to the bridge and captain's cabin (additional $20 per person). Entrance fee: Adults: $15.95, Children (Ages 4-12): $11.50, Children (Ages 3 and under): Free, Seniors (Age 55 and up) and AAA Adults: $14.95. Spirit of Norfolk cruise / tour. 36.8786-76.27745 Virginia Zoo, 3500 Granby St, ☎ +1 757 441-2374. Daily 10AM-5PM. 36.847701-76.288626 MacArthur Memorial, 198 Bank St., ☎ +1 757-441-2965. Tuesday - Saturday 10:00am - 5:00pm Sunday 11:00am - 5:00pm Monday Closed. Free. 36.8521-76.29287 West Freemason Street Area Historic District (Along West Freemason Street, west of Bosch Street). 24 hours. National historic district with houses and churches in Federal, Greek Revival, Late Victorian and Gothic Revival styles. Free. Take a cruise from Norfolk to Bermuda or the Caribbean. Ships depart from the downtown waterfront. Go on a 2 hour cruise around the Norfolk Naval Base. A guide will give a little bit of area history and describe some of the ships as you cruise past. 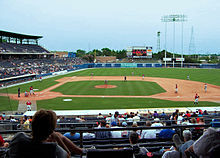 Watch a Triple-A baseball game between Norfolk Tides and another minor league team at the 36.842789-76.2788691 Harbor Park, 150 Park Avenue (Take The Tide to Harbor Park station or Amtrak to Norfolk station). Watch a concert, ice hockey game or performance at 36.8533-76.2872 Norfolk Scope, 201 East Brambleton Avenue. Watch a concert, live music and other performance at 36.8503-76.28973 NorVa Theatre, 317 Monticello Avenue, ☎ +1 757-627-4547. There are several main shopping areas in Norfolk. Downtown, the 36.8489-76.28861 MacArthur Center (300 Monticello Ave.) is one of the best malls in the area and has a variety of great shops, like Pottery Barn, Coach, Williams & Sonoma, an Apple store, JCrew, EQ3, H&M, a beautiful Barnes & Noble academic superstore, etc. The mall is anchored by Nordstrom and Dillard's. There are a few shops and art galleries on Granby Street, but not many. Also downtown is the D'Art Center, which features a large selection of local art. Waterside used to be a popular shopping area, but there are several empty spots now and retailers are suffering. There are a few kiosks, with everything from fake designer sunglasses to caricatures. There are a few other stores, including souvenir shops and a dollar store. 36.862-76.29792 Ghent. (updated Feb 2018) is a popular shopping area for locally-owned boutiques and antique stores. 21st Street and Colley Avenue are the main thoroughfares, but there are plenty of unique stores on the surrounding streets. The Palace Shoppes on 21st Street and Palace Station on Debree have some great little stores, including an adorable pet boutique call Wet Noses and a chic women's clothing store, NYFO. Commonwealth on 21st Street is a popular urban-style store, and has been featured in national magazines. There are also quite a few antique stores around Ghent and throughout Norfolk. The signature symbol of Norfolk is the mermaid, and there are several stores that sell unique mermaid sculptures, pins, jewelry and more. Doumar's in Ghent on Monticello Avenue is known as the birthplace of the ice cream cone. The vintage drive-thru still remains. Try an ice cream cone or banana shake. Todd Jurich's Bistro casual elegance, an upscale restaurant two blocks from waterside(they do not require suit and tie). They have a four diamond award for their food and an award of excellence from Wine Spectator. For a deal, Todd's Bistro appears on every one of Norfolk's Restaurant Weeks. Cracker's Little Bar Bistro, 821 W 21 St (Ghent Area), ☎ +1 757 640-0200. Daily 5PM-2AM. This tiny joint serves amazing tapas (appetizer-sized plates) and a wide variety of fun martinis. There's only about 7 tables in the entire place, plus bar seating. If you go, I suggest going right at 5PM, else you can't be sure you'll be seated right away. Two people can try a bunch of different tapas (try the filet with mashed potatoes), have a few martinis, leave a great tip, and spend less than $50. $4-9 per plate. Vintage Kitchen located at the bottom of the Dominion Tower has been voted one of the best restaurants in the entire region. The chef-owned eatery specializes in using ingredients local to Virginia, such as Smithfield ham, peanuts, strawberries, cheeses and vegetables from local farmers. A.W. Shucks is tucked behind a mini-mall Ghent, but it is a popular restaurant and watering hole with great burgers, seafood and beer selection. No Frill Bar and Grill on Spotswood Ave in Ghent features inexpensive, yet delicious American cuisine with numerous vegetarian options and a good selection of alcoholic beverages. Three sections of Norfolk have concentrations of bars and nightclubs: Ghent, Granby Street, and the Waterside Festival Marketplace. Ghent is the most laid-back, Granby Street is a trendy place for dates, and the Waterside is the wild place for the kids. Just follow the noise. Charlie's American Cafe - 4024 Granby Street. A cafe by day, and nighttime music venue and club that hosts independent music artists. Norfolk's good hotels are clustered downtown and near the airport. Norfolk Airport Hilton, 1500 N Military Hwy. 248 deluxe guest rooms. 15 meeting rooms. 3 restaurants. Ramada Norfolk Airport, 1450 N Military Hwy, ☎ +1 757 466-7474. Ramada Limited Norfolk, 515 N Military Hwy, ☎ +1 757 461-1880. Sheraton Norfolk Waterside, 777 Waterside Dr (Downtown). The only downtown hotel on the waterfront. Connected to the Waterside Festival Marketplace. Moderate walk to the cruise terminal. Request a water view. Newport News Marriott at City Center, 740 Town Center Drive, ☎ +1 757 873-9299. Norfolk Waterside Marriott, 235 E Main St, ☎ +1 757 627-4200. Check-in: 4PM, check-out: 11AM. Set in the heart of the historic district, this award-winning Norfolk hotel is just steps away from the vibrant, revitalized waterfront. Norfolk Marriott Chesapeake, 725 Woodlake Dr, ☎ +1 757 523-1500. Check-in: 3PM, check-out: noon. Crime is less bad than before, but the city's slums are obvious and should be avoided at night. There have been incidents downtown so use caution at night, especially if you are alone. As the city is close to sea level, intense rain or high winds often can cause localized flooding on roads especially near the downtown area. Free WiFi is available from 6am to 8pm at MacArthur Square in downtown. The Tide light rail offers free WiFi on board. The Virginian-Pilot is Norfolk's daily newspaper. The Friday edition includes Pulse, a section which has an extensive listing of festivals, concerts, and other activities in the Norfolk area. The New Journal & Guide is a weekly newspaper serving the Black community in Norfolk. Italy (Honorary), 300 E Main St Ste 1180, ☎ +1 757 622-4898, fax: +1 757 622-0562, e-mail: itacons@attglobal.net. Norway (Honorary), 201 East City Hall Avenue, ☎ +1 757 457-8330, e-mail: norwegianconsulate@anderswilliams.com. This city travel guide to Norfolk is a usable article. It has information on how to get there and on restaurants and hotels. An adventurous person could use this article, but please feel free to improve it by editing the page.